Black Dragon Pearls 12oz - Silver Tea Tin. 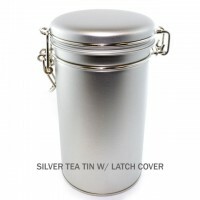 The silver tea tin with latch lock is great to keep your favorite Loose Tea airtight and light tight for fresher tea. This air tight and light tea tin helps keeping the tea aroma better and longer, better tea color as well. This is a great gift idea for tea lover or tea starter. 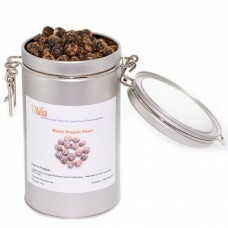 Black Dragon Pearls tea are hand rolled loose leaf tea into pearls shape. When steeping Black Dragon Pearls; it pearls shape make it easy to steep, simply drop 3 to 5 pearls into your favorite teapot steep and serve. If you like a stronger tea taste, just add more pearls. 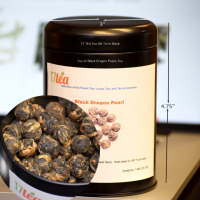 We suggest using 2-3 Dragon Pearls per cup for a sublime tea drinking experience. Steep at 195°F for 3-5 minutes. 7oz Tea Gift Tin- Black Dragon Pearls Tea Black Dragon Pearls tea is our No. 1 all time best seller..